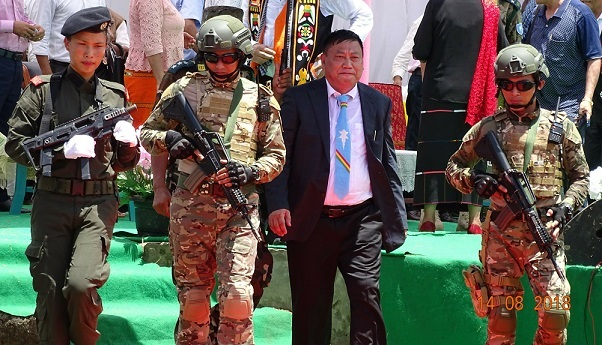 NSCN (IM) kilo kilonser (home minister) Hukavi Yepthomi arriving to attend the 72nd Naga Independence Day at Camp Hebron on August 14, 2018. Photo: Northeast Now. The NSCN (Isak-Muivah) said the future of the Nagas now is secured and protected from external forces as “our position in terms of our history and political rights” has been acknowledged and recognised by the government of India. 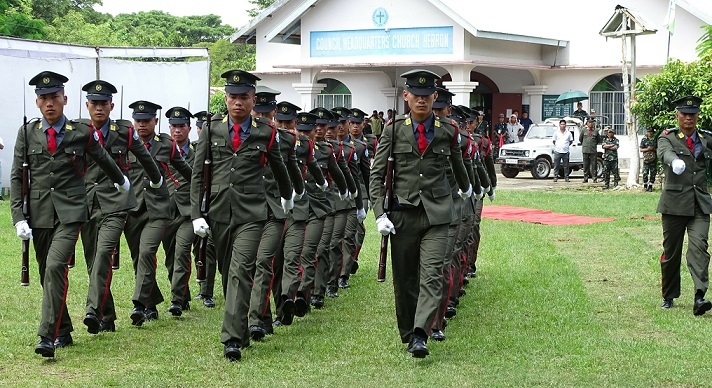 The NSCN (IM) celebrated 72nd Naga Independence Day on Tuesday at its headquarters at Camp Hebron, 50 kms from here. “We had done what we could in all these years of political negotiations with the government of India, and there is not much to be done now. Final solution will come as and when God is pleased with us,” NSCN (IM) vice president Kholi Konyak said while greeting the Naga people on “72nd Naga Independence Day” on Tuesday. Konyak’s speech was read out by the outfit’s kilo kilonser (home minister) Hukavi Yepthomi. He said the Naga people began their political struggle with God and will accomplish it with God. He said the Naga people declared independence from the British colonialists one day ahead of Indian independence on this day in 1947. He called it the result of the right and timely decision of the visionary Naga leaders of the time. According to Konyak, the Nagas are bound to perish together until and unless they realize that their greatest enemy is within ourselves in the form of egotism, jealousy, selfishness, hatred, self-righteousness. “We have to overcome this if we are to survive as a nation,” he stated. He wanted all the members of NSCN to remember that they have come to serve the nation and not to ask the nation to serve them. The NSCN (IM) leader further stated that they do not want to live in hostility with the neighbours. He said the NSCN wants a peaceful coexistence with neighbours and respect for each other’s history and rights. Konyak said the NSCN wants the neighbours to appreciate this “because at the end of the day Naga political solution will be beneficial to them too”. He further said the NSCN is also ready to understand together with the neighbours the issues of each other’s history and rights provided they come with rational and realistic approach and are prepared to appreciate the history and the right of the Naga people in its right perspective.